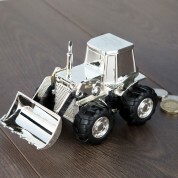 Encourage your little one to start saving with this silver plated digger money box. 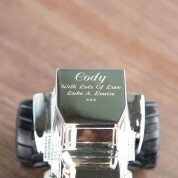 It is an ideal gift for a new born baby, 1st birthday, christening or any other special occasion. This money box has a slot at the back for your child's hard earned pennies and is finished off with a personal message engraved on the diggers roof. 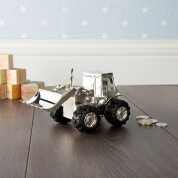 Any little one will be able to push the digger along the floor as it has actual moving rubber style tyres and a moveable scoop too. It will fit in nicely with any nursery or child's bedroom theme and can take pride of place on a book shelf or on top of a chest of drawers. Dimensions: 14cm x 8xm x 8cm.